Although she never raced, Crystal Clear has made a cracking start to her career as a broodmare at Rob and Michele Pickering’s Middlefield Stud, producing outstanding progeny including four runners and three winners. Clear Creek, Crystal Clear’s dam was acquired under unusual circumstances. “Clear Creek was owned, raced and bred by Pip Davis of Rondebosch Farms,” explains Rob Pickering. “Clear Creek ran second in the Grade 1 Paddock Stakes beaten by a short head with Muis Roberts riding her. He got off after the race and said that he was terribly sorry, that he should have won the race. “Clear Creek was given to Jack Lunn in Himeville by Pip Davis. We phoned Jack Lunn and asked if there was any chance of Clear Creek coming back to breed and he said: ‘well, why shouldn’t she breed?’ The vet had said she would never be able to have a foal, and Jack said ‘that guy doesn’t know what he is talking about because she has a Basuto pony foal at foot! 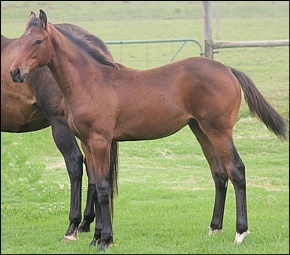 In terms of Crystal Clear’s pedigree, she is by Alami and is a daughter of Clear Creek, who in turn is out of Miss Honeychild, a stakes winning daughter of the wonderful sire Persian Wonder. Crystal Clear’s first foal, Winter Crystal, is by Winter Romance. 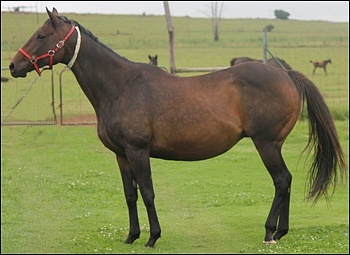 This gelding had four wins and placed 9 times over a distance of 1200-1400m, and earned R188 220. Her next Martinelli foal, a colt named Thunder Creek would do her very proud. 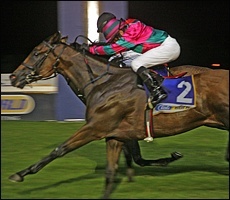 He won eight times including the Gr 3 King’s Cup, defeating Thandolwami by .25 of a length. He placed 11 times, earning himself R590 385 in stakes over a distance of 1200-1600m. Her next colt by Rakeen was named Clearly Keen – and he won and placed from just five starts over 1600m. 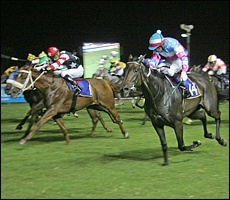 Clearly Keen sold for R1-million at the 2008 Emperor’s Palace National Yearling Sale. Crystal Clear also has a yearling called Buck Shot by Carpocrates, which Rob describes as “A real cracker. He is my best colt going to the Nationals.” He has been consigned to the upcoming Emperor’s Palace National Yearling Sale at the end of April this year. Crystal Clear currently has a magnificent foal at foot named Blind Rise, again by Middlefield’s resident stallion Carpocrates (Storm Cat – Spain by Thunder Gulch). Crystal Clear’s dam, Clear Creek is a five-time winner including the Gr 1 Flamboyant Stakes, and she placed second in both the Arc-En-Ciel Paddock Stakes Gr 1 as well as the Computaform Debutante Stakes, and third in the Guardian National Fillies Guineas Gr 1 and JB McIntosh Fillies Classic. To date this mare has produced a five foals, four runners and four winners, the unraced foal being the subject mare. Her most prolific horse produced has been Clear As Day Light by Modern Day. This gelding has achieved four wins and earned R233 403 in stakes over 1400-1600m and he has placed nine times. Clear Creek’s three-parts sisters Miss Ryder (Red Ryder) and Russian Belle (Krusternstern) are also stakes producers. Miss Ryder is the dam of Gr 2 winner Weston Paint and multiple stakes and five-time winner Winona, while Russian Belle bred last season’s Gr.2 winning juvenile Silver Age. The dam-line continues to include the likes of Gr 2 SA Fillies Nursery winner Hawaiian Wahoo, Gr 3 Lonsdale Stirrup Cup winner Mighty Mandarin and five time winner Heavenly Wonder. Crystal Clear is currently in foal to top-five stallion on the National Sires Log, Kahal. 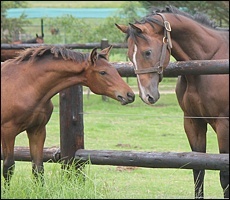 To view a few of the foals from Middlefield Stud, click here.